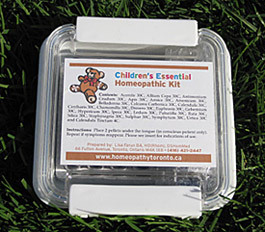 In addition to exceptional homeopathic care and treatment, I am pleased to offer these remedy kits for sale. 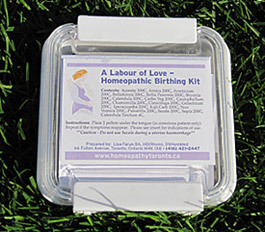 Each kit comes in a handy, hard cover travel case and comes complete with indications for remedy use. 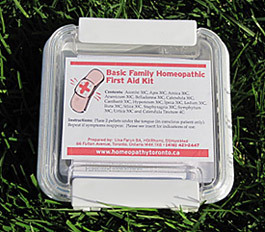 If you would like to purchase a remedy kit, please contact Lisa Farun at (416) 421-2447 or by e-mail at lisa@homeopathytoronto.ca. For the treatment of: bee stings and other insect bites; blisters; bone fractures; bruised bones; bruises and falls; burns; cuts; diarrhoea; sudden high fever; food poisoning; injury and trauma; nausea; nettle rash; puncture wounds; scrapes and open wounds; splinters & thorns; sunburn; swelling; vomiting; infected wounds and many more first aid ailments. For the treatment of: allergies; bee stings and other insect bites; blisters; bone fractures; bruised bones; bruises and falls; burns; colds; coughs; cuts; diaper rash; diarrhoea; sudden high fever; food poisoning; injury and trauma; nausea; nettle rash; pink eye; puncture wounds; scrapes and open wounds; splinters & thorns; sunburn; swelling; teething; vomiting; infected wounds and many more first aid and children’s ailments.